« Occupy 2012: Another 1968? The Pew Research Center recently reported news about marriage from the U.S. Census Bureau: In 2010 just 51% of all American adults were married, compared to 72% in 1960, and Americans who did marry tied the knot later in life. In reality, the situation is not as radically new as it seems. 1950 through 1960 was the most marrying (and parenting) decade in generations – in perhaps all — of American history (see here, here, and Ch. 4 of here). Marrying rates and ages around the turn of the 21st century are more like those a century ago; both periods differ greatly from the middle of the 20th century. Still, Americans are breaking new paths to marriage in the 21st century. Not only are today’s couples wedding later – the average bride is about 26 years old and the average groom is about 29, compared to 20 and 23 years old around 1960 – but the culture has shifted greatly. The 1950s were special. 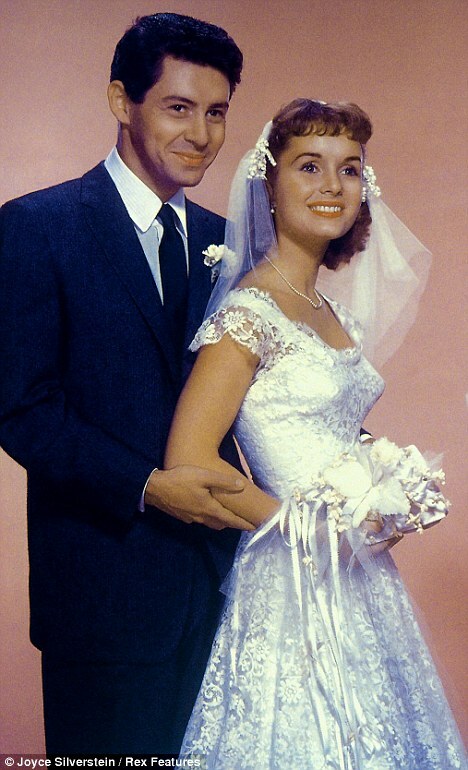 Couples married at probably the youngest age in American history; middle Americans got “pinned” in high school (those too young to get the reference, see here) and married almost immediately afterwards; for most, marriage marked their first time living away from their parents; and many were sexually naive. These days, the typical couple marries a decade after high school and – importantly – after having lived together for a while. Back in the late 19th century, many Americans waited a long time to marry or they never married (see this earlier post on spinsters). Afterwards, higher percentages Americans married and they married at earlier ages. Today is more like the end of the 19th century. The graph below, borrowed from a paper by Tomas Cvrcek, gives you a picture of the long-term trend. It shows, for white men and women, the percentage in each decade who had reached age 45 to 54 having never married – effectively the permanent spinsters and bachelors. The percentage of spinsters and bachelors peaked in 1911-1920, when about 11% of those who had been born between 1866 and 1875 were not and had never been married. Around 1980, the middle-aged never-married reached bottom, only about 5%, reflecting all that marrying that had been going on in the 1950s. Then, the wheel turned again and we see the percentage of never-married going back up to a current 11% or so. A graph showing the median age at which Americans married looks roughly similar but flipped upside down: Brides and grooms were, on average, older if they married around 1920, very young if they married around 1960, and are older when they marry now. 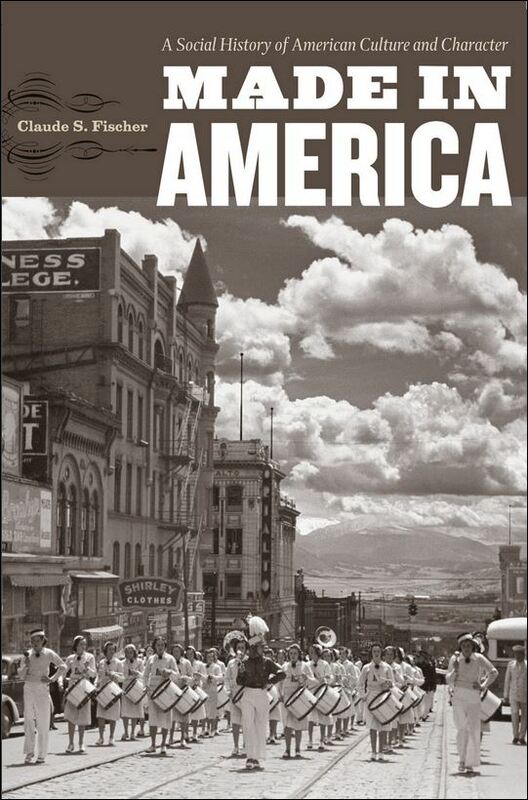 What we learn is that, in gross terms, it was the 1950s-60s that were most unusual – not our era. Now, let’s go back to look at the last half-century, when, according to the Pew report, Americans increasingly delayed getting married and eventually almost half of adults were unmarried. (By the way, that half-of-adults estimate is ballooned in some measure because it reflects the longer lives of widows.) What has changed the most in the last half-century is not that American adults have given up on coupling up, but that they have increasingly taken a route to marriage that goes through cohabiting. Two graphs will illustrate the point. The data come from the National Family Growth Studies. (Thanks to Jon Stiles of UC Data for bringing the numbers together.) What we do is distinguish adult women – 20-year-old and 40-year-old women separately – by whether they (a) have never married nor lived with anyone – blue; (b) married directly without cohabiting – red; (c) cohabited but not yet married – green; and (d) cohabited and then married– purple. (There is another, small group — those who married, then got divorced or were widowed, and then cohabited — but I leave them out for simplicity.) The first graph below shows the situations of 20-year-old women, comparing those who were born in the 1940s, the 1950s, through to the 1980s. What we learn here is, first, that, yes, the chance of being single at age 20 rose over the five cohorts, but not by that much – from about 50% for those born in the 1940s, who became 20 about 1965, to about 60% for the last cohort who turned 20 around 2005. Second, recent cohorts were much less likely to have gotten directly married. About 46% of the earliest cohort had, when 20, first lived with a man upon marrying, but only about 5% of the latest cohort had directly married by the time they were 20. The third thing we learn is that 20-year-olds increasingly were living with someone – the green segment. Almost no 20-year-olds in the 1960s (only 2%) were cohabiting, but in the 2000s almost a third were. What really changed was not the rates of living with a man but the rates of living with a man outside of marriage. Next, let’s look at the 40-year-olds. First, note how few American women, about 5%, had neither married nor cohabited by the time they were 40 (the blue segment) and how little that percentage changed. 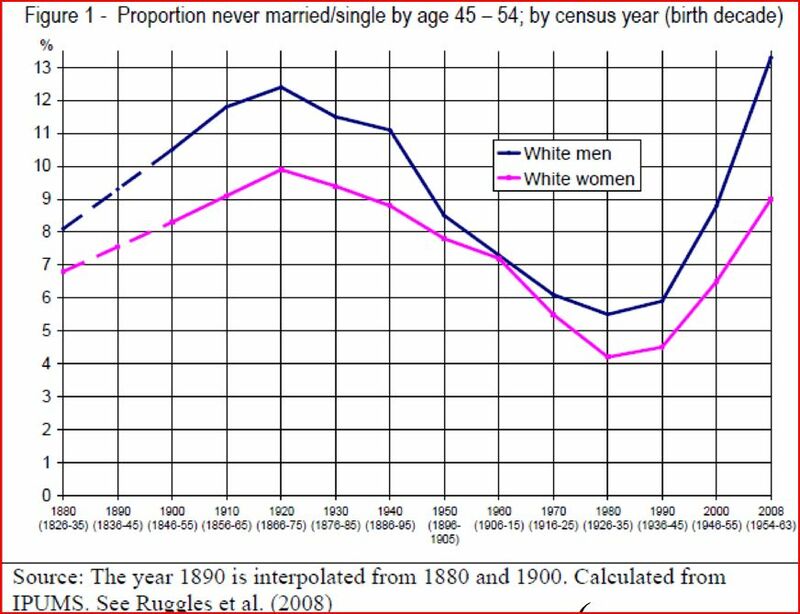 Second, note that the great majority of women at age 40 were married (the red plus purple segments): 80% of those born in the 1940s; 77% of those born in the 1960s. Third, note that the big change, again, is the role of cohabitation – in this case as a transition. 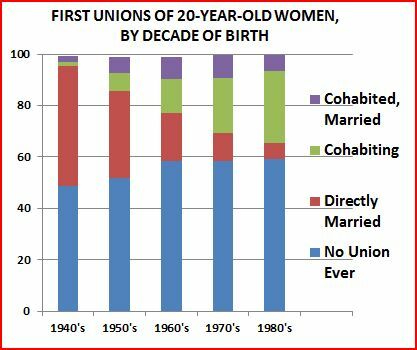 The percentage of 40-year-old women who had married into their first union dropped from 70% to 38%; the percentage who had cohabited and then married rose from 10% to 38%. The news here, then, is about a change in the life-course pattern. Although it is true that singlehood has become somewhat more common, the most dramatic change has been for more Americans to live together for a bit and then marry (marry either the person with whom they cohabited or someone else). Many issues arise around living together (some discussed in this earlier post). Cohabitation is not as stable as marriage and not as good for children – although as cohabitation has become more common, the disadvantage compared to marriage has shrunk. Also, most Americans prefer marriage. Many lower-income couples have increasingly delayed marrying because of the financial uncertainties would-be husbands face (– not, as some have suggested, because it is their preference). Cohabitation is not (yet) seen as equivalent to marriage. One interesting testimony to how much Americans want to marry is the insistence in the gay community that partnership arrangements are not enough; they want to marry. 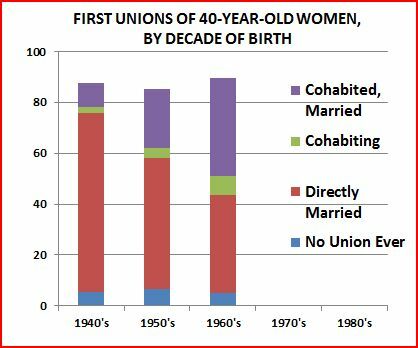 Final historical note: Back before the 1950s and back in the 19th century, cohabitation was much more common than we might imagine. We have no decent numbers, because the government did not gather the data and, more importantly, cohabiters then often reported themselves as married rather than face shame (as did, by the way, many women whose husbands had abandoned them). The shame of living together has gone.